Thiago Honório will speak about his current project The Red Studio and The Red Studio II, in which he altered the walls of his ISCP studio with material remnants from his 2014 home renovation in São Paulo. He will also present his related research on architectural and spatial relations. 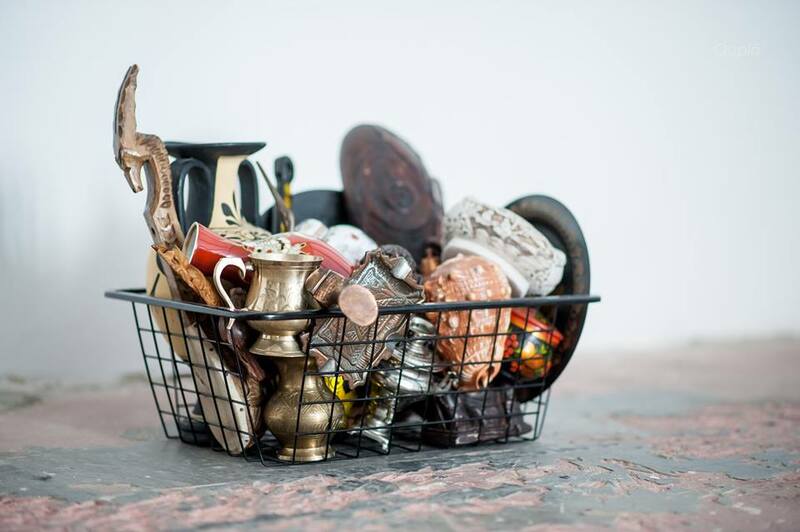 Rasmus Søndergaard Johannsen will introduce his sculptural practice in which he manipulates materials and tools against their inherent nature. He will also present plans for his next series of sculptures, which he will work on during his ISCP residency. This program is supported, in part, by Danish Arts Foundation; Director’s Circle; Hartfield Foundation; Luciana Caravello; Marcus Vinicius Ribeiro – Special Advisor on Brazilian Sponsorship; New York City Department of Cultural Affairs, in partnership with the City Council; New York State Council on the Arts with the support of Governor Andrew M. Cuomo and the New York State Legislature; and Stavros Niarchos Foundation (SNF). 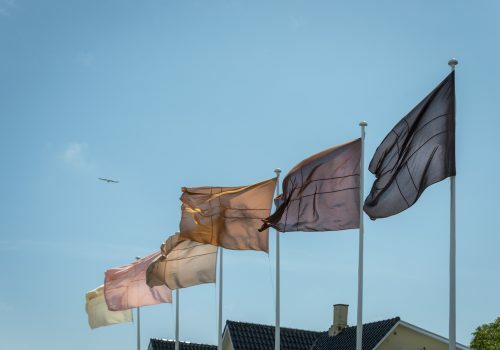 Rasmus Søndergaard Johannsen, Lineated Luminary 29042018, 2018, tapestry sculpture, 39 × 39 in. (99.06 × 99.06 cm). 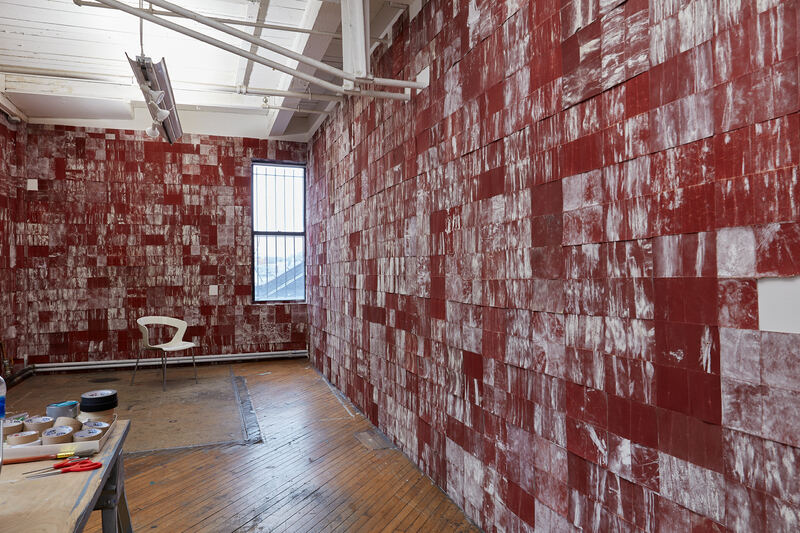 Thiago Honório, The Red Studio, 2014/2019, sandpaper-coated walls, dimensions variable. Photo by On White Wall. As part of the public programing for 5533’s institutional residency and exhibition Under the Radar, artist Fatma Bucak and curator Isin Önol are enacting and orchestrating the Sen ve Ben 5533 Project (You and I 5533 Project), conceived by artists Merve Ünsal and Nancy Atakan, and first executed last year in Istanbul. The project brings together individuals to realize projects, collaborations, or events that promote sharing, interaction, discussion and dialogue. Bucak and Önol will focus the strands of their research which overlap, particularly art for freedom during times of political turmoil and how collective memory is shaped by contemporary authoritarianism. Burak Arıkan will also present his work Islam, Republic, Neoliberalism (2012) which is currently exhibited in Under the Radar: 5533 at ISCP. Burak Arıkan is a New York and Istanbul based artist working with complex networks. He takes social, economic, and political issues as input and runs them through custom abstract machinery, which generates network maps and algorithmic interfaces, results in performances, and procreates predictions to render inherent power relationships visible and discussable. Arikan has presented his work internationally at institutions including Museum of Modern Art, New York; Venice Architecture Biennale; São Paulo Biennial; Istanbul Biennial; Berlin Biennial; Sharjah Biennial; Marrakech Biennial; Ashkal Alwan; Ars Electronica; Neuberger Museum of Art; KW Institute for Contemporary Art; Kunstmuseum Bochum; Asia Art Archive and Borusan Contemporary. Fatma Bucak lives and works in London, and is currently an ISCP resident. She investigates the fragility, tension and irreversibility of history and the power of testimony and memory in her practice, often questioning traditional forms of history-making as well as cultural and gender norms. Solo exhibitions include Merz Foundation, Torino; GAM Palermo (both 2018); Brown University David Winton Bell Gallery, Boston; Pori Art Museum, Finland (both 2016); Artpace, San Antonio (2015); Castello di Rivoli, Museum of Contemporary Art, Torino (2014) and ARTER, Istanbul (2013). 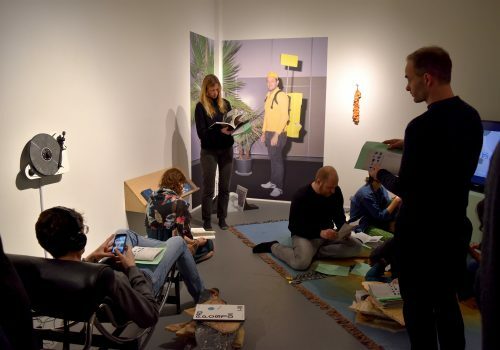 Major group exhibitions include GIBCA 2017 – Goteborg International Biennial for Contemporary Art; Mophradat, Brussels; Beirut Art Center; Jewish Museum, New York; International Festival of Non- Fiction Film, MoMA, New York; Bloomberg New Contemporaries 13, ICA, London, Spike Island, Bristol and the 54th Venice Biennale. Isin Önol lives and works in New York. 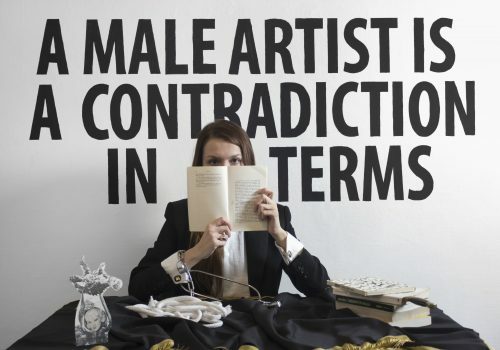 She has produced a number of exhibitions in the United States, Austria, and Turkey as an independent curator since 2009. Before that, she led the Elgiz Museum of Contemporary Art in Istanbul as its director and curator. She is an an adjunct professor and guest critic at Montclair State University. As a guest lecturer and critic she has presented her work at New York University, Parsons, the School of Visual Arts, Transart Institute and Columbia University in New York, as well as other respected visual art programs in Austria and Turkey. She is a member of the Center for the Study of Social Difference at Columbia University and is currently a member of the board of directors at the Roberto Cimetta Fund. This program is supported, in part, by Greenwich Collection Ltd., Hartfield Foundation, New York City Department of Cultural Affairs, in partnership with the City Council, New York State Council on the Arts with the support of Governor Andrew M. Cuomo and the New York State Legislature, Pera Soho, The Andy Warhol Foundation for the Visual Arts, and Stavros Niarchos Foundation (SNF). 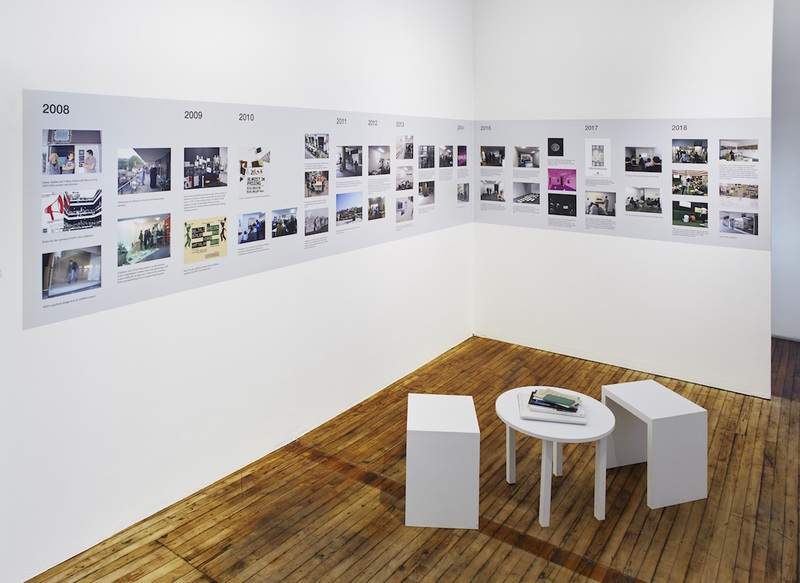 Under the Radar: 5533 at ISCP, installation view of a timeline of 5533's ten year history. 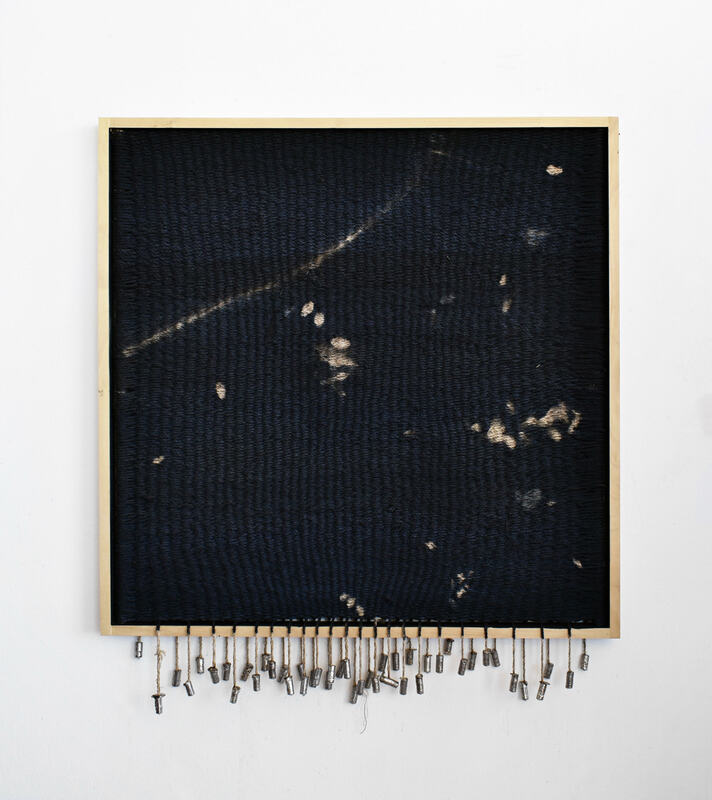 Marius Ritiu will be in conversation with Kathleen Forde, Artistic Director of Borusan Contemporary in Istanbul, about his recent work which focuses on cosmology, the scale of the universe and the alchemical transformation of everyday objects. Marta Fišerová Cwiklinski will present her past projects as well as a new project in progress titled The Fourth Greenhouse. Her work highlights the intersection of personal stories, history, the passage of time, and finally their reconstruction by way of storytelling. The Fourth Greenhouse focuses on the enclosure of natural and manmade forms to create an artificial paradise. This program is supported, in part, by ATI – The Arts and Theatre Institute; Hartfield Foundation; Kunsten en Erfgoed; Ministry of Culture Czech Republic; New York City Department of Cultural Affairs, in partnership with the City Council; New York State Council on the Arts with the support of Governor Andrew M. Cuomo and the New York State Legislature; and Stavros Niarchos Foundation (SNF). Marta Fišerová Cwiklinski, Pavilion of the Empty Illusion, 2017, mixed media. Photo by Martina Schneiderova. 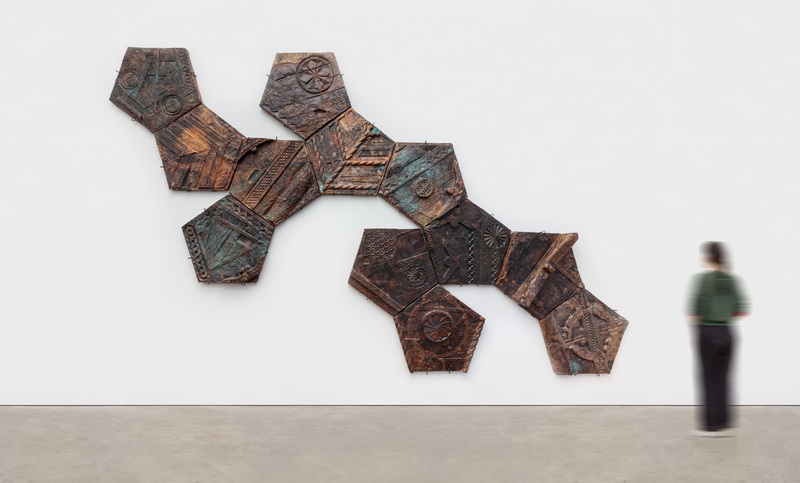 Marius Ritiu, 2017, wood and beaten copper, 225 × 144 × 9 in. (571.5 × 365.76 × 22.86 cm).